Au Pair Sponsor Agencies Settle Wage Lawsuit, Offer $65.5 Million In Back Pay The complaint alleged 15 companies, who at the time controlled 100 percent of the au pair workforce, colluded to keep wages artificially low and denied the workers overtime pay. 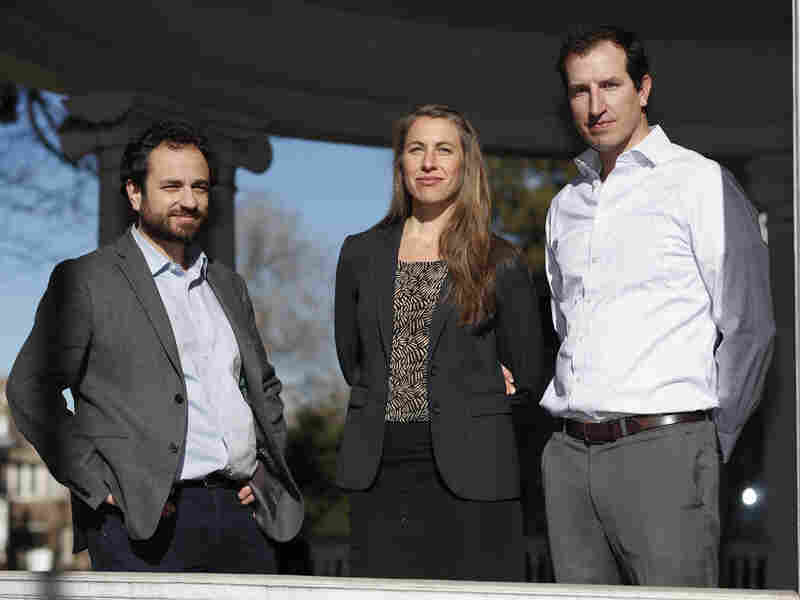 Attorneys, from left, David Seligman, Nina DiSalvo and Alexander Hood of Denver's Towards Justice, which filed a lawsuit on behalf of au pairs for higher pay. Underpaid au pairs who have worked in homes across America, taking care of children, often cooking, cleaning, playing chauffeur and providing a range of other duties, will finally receive back pay they say they are owed. On Wednesday, 15 of the companies authorized by the State Department to recruit young foreigners to provide low-cost child care in U.S. households reached a $65.5 million settlement in a class-action law suit filed by nearly a dozen au pairs in a Denver federal court. About 100,000 former au pairs who worked in the U.S. between 2009 and 2018 are covered under the deal, which still needs to be approved by the court. The lawsuit alleged sponsor agencies kept wages artificially low and denied the workers overtime pay. The case was scheduled to proceed to trial on Feb. 25. "Our argument was that they colluded together to keep their wages well below state and federal minimum wages, and [prospective au pairs] were being told by sponsor agencies that the wages were set and that there was no room to negotiate," Peter Skinner, a partner with Boies Schiller Flexner, which represented the au pairs, told NPR. In reality, he continued, "Au pairs have always had the ability to negotiate their salaries under the existing regulations but they were being given incorrect information." "We're pleased that our years of hard work will bring justice to so many young child care workers and fundamentally change the way the au pair industry operates," Skinner added. In addition to the monetary compensation, the settlement included a requirement for all companies to provide future au pairs adequate information about their rights under U.S. laws. David Seligman, director of Denver-based Towards Justice, the advocacy group that filed the lawsuit in 2014, added in a statement: "This settlement, the hard-fought victory of our clients who fought for years on behalf of about 100,000 fellow au pairs, will be perhaps the largest settlement ever on behalf of minimum wage workers and will finally give au pairs the opportunity to seek higher wages and better working conditions." According to the lawsuit, agencies falsely claimed that the government set their maximum weekly wage at $195.75 for a 45-hour work week, which breaks down to $4.35 per hour. The federal minimum wage is $7.25 per hour. Sponsor agencies have consistently denied the accusations arguing that they follow the State Department's guidelines which allow families to deduct 40 percent of an au pair's salary to cover room and board, which they are required to provide. That is how most families arrive at the $195.75 pay check as opposed to $344.38 for 45 hours per week. "There's always been one nationwide stipend," Michael McCarry, director of the Alliance for International Educational and Cultural Exchange, an industry group that represents many of the sponsors, told the Denver Post in 2016. "[The State Department] has never raised the issue with us about state minimum wage laws," McCarry noted. Au pairs are authorized to live and work in the U.S. under the State Department's J-1 visa program. It was established in 1986 and is described as a cultural exchange, giving participants the opportunity to study, improve their English and learn about the United States. But critics of the program, who say it fosters underpaid labor and that it is rife with abuse, have long argued that it should be administered by the Department of Labor. "They certainly would do a better job than the Department of State, which doesn't have experience vetting host families and making sure that abusive host families don't remain within the program," Elizabeth Mauldin, policy director at Centro de los Derechos del Migrante, told NPR's Here & Now. Skinner noted it will likely take several months to track down about 100,000 au pairs who worked in the U.S. over the nine years covered by the law suit. And although, the settlement did not resolve the central disputes over an appropriate minimum wage for the caregivers or establish the scope of their responsibilities, Skinner said he is confident sponsor agencies will increase their salary guidelines and reevaluate recruitment efforts. "I am optimistic that they will see it makes economic sense to offer higher wages that attract better skilled au pairs," Skinner said.